Design by the Bakerygroup, 2000-2004. Suspended lamp for diffused lighting. White painted metal canopy. The diffuser is made up of an opal polypropylene plate held by a white polyester microfibre removable washable envelope. 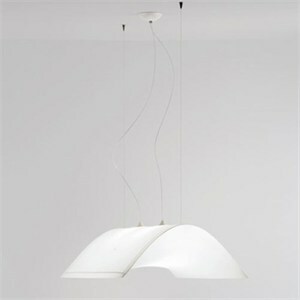 Pendant is available in two sizes, and the larger size offers two lamping options. 33S (small)- 35.4"L X 31.5"W X 7.8"H; 78.75" maximum overall height. Uses 1 X 55W 120V 2G11 twin tube fluorescent lamp (not included), electronic ballast. 34S (large)- 47.25"L X 31.5"W X 7.8"H; 78.75" maximum overall height.Uses 1 X 55W 120V 2G11 twin tube fluorescent lamp (not included), electronic ballast. 34S6 (large)- 47.25"L X 31.5"W X 7.8"H; 78.75" maximum overall height. Uses 2 X 40W 120V 2G11 twin tube fluorescent lamps (not included), electronic ballast.